"Massachusetts Death Records, 1841-1915," indexed database with digital image, Ancestry.com (http://www.ancestry.com : accessed 19 February 2015), -up through 1902 > 1842, Norfolk County, Medfield, page 262 (image 2-04 of 562), Aaron Smith death record. "Massachusetts Vital Records, 1841-1915," indexed database and digital images, New England Historic Genealogical Society, American Ancestors (http://www.AmericanAncestors.org : accessed 1 March 2017), Volume 1, page 262, Deaths, 1842, Norfolk County, Medfield, Aaron Smith entry. Interestingly, this specific record is not included in Ancestry.com's database for "Massachusetts Vital and Town Records, 1620-1988." That database does have the death record from the published book for Vital Records of Medfield, Massachusetts to the Year 1850. Howcver, the book does include the occupation or cause of death information. The record shown above is a Derivative Source, with Primary Information and Direct Evidence of the death of Aaron Smith. It is a Derivative Source because the death was recorded in the Medfield town records by the town clerk, and then a transcription of the death records for the year ending May 1, 1842 were sent to the state government and was included in the Massachusetts Vital Records files, which were microfilmed and indexed by the FHL, and then digitized on American Ancestors, FamilySearch and Ancestry and put in searchable online databases. The occupation of Aaron Smith as a "shoemaker" and the cause of death as "Dropsy" were new information for me recently - the vital record book did not include that information. I have added that information to my database and have added the source citation, and the digital image, to my RootsMagic database. 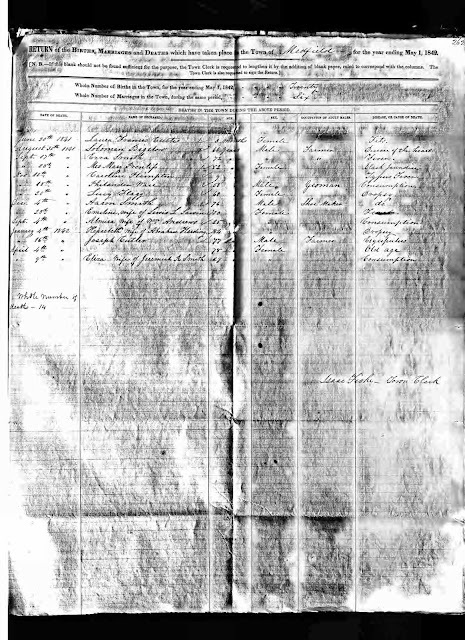 Aaron Smith (1765-1841) is my 4th great-grandfather, son of Moses and Patience (Hamant) Smith of Medfield and Walpole, Mass., who married Mercy Plimpton (1772-1850) in 1795 in Medfield. I am descended through their son Alpheus B. Smith (1802-1840) who married Elizabeth Horton Dill (1791-1869) in 1826 in Dedham, Mass.